I think that the Nasdaq topped this week. Looking at the chart you can see a perfect impulse: a line connecting the ends of waves [ii] and [iv] is parallel to the line connecting the ends of waves [i] and [iii]; and wave [v] ended at the middle line. The same structure we got for the subwaves of wave [iii] by the way. Even though this looks perfect I added an alternative count which allows for one more new high. But since I don't see an alternative bullish count for the Dow I give it a very very low probability. If you compared the actual count with last weekend's count you might have spotted that I've slightly changed it. 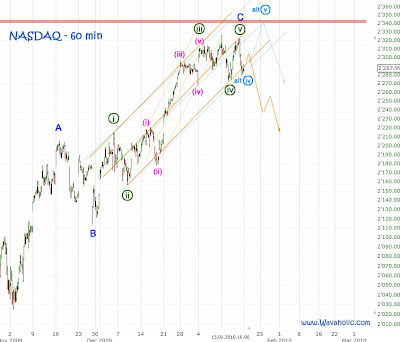 The reason why I've changed it is to align the Nasdaq count with the Dow and the SPX which both made a new high on Thursday. So, I think the rally ended with a truncation for the Nasdaq.